Evanston’s equity and empowerment coordinator Patricia Efiom speaks at a 5th Ward meeting in April. Efiom on Saturday presented an equity framework to aldermen. Evanston’s equity and empowerment coordinator urged aldermen Saturday to consider a framework meant to ensure the city approaches all policy through an equity lens instead of on a case-by-case basis. 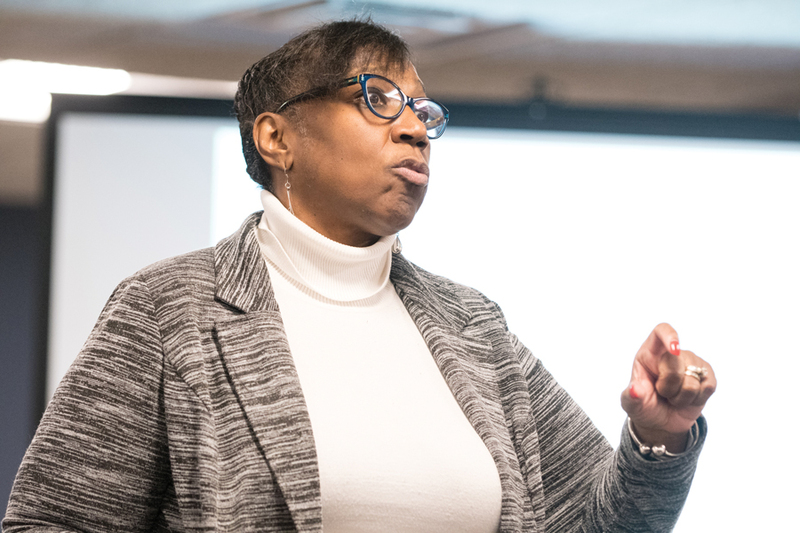 In a budget equity review, Patricia Efiom introduced the goals of the Equity and Empowerment Commission’s proposed framework to aldermen for the first time. If adopted on Jan. 1, the framework would create a seven-step equity process where city staff would approach all policy review by engaging with communities they believe could be negatively impacted. Most aldermen were receptive to the proposed equity framework, which forced them to reevaluate the process by which they wanted to seek equity. Ald. Peter Braithwaite (2nd) said he agreed with Efiom’s top-down approach, which he added he hadn’t considered before. Ald. Judy Fiske (1st) was also supportive of the framework and said she agreed that the city needs to approach equity in a more systematic manner. Efiom said the city hadn’t properly engaged with vulnerable groups when drafting the proposed budget for fiscal year 2019, which includes city-wide cuts to fix a projected $7.4 million deficit. Many proposed budget cuts — like those to the Department of Health and Human Services and the Evanston Fire Department — would harm citizens’ quality of life more than initially thought, Efiom said. While the city won’t be able to apply the proposed equity framework to the budget, Efiom still pressured aldermen to consider vulnerable populations as the budget is finalized. Efiom’s concerns over the budget, Braithwaite said, were similar to resident’s concerns the city had heard during the public hearing portion of the meeting. The Equity and Empowerment Commission is expected to present its equity framework to the Human Service Committee on Dec. 3 so it can reach City Council for a vote on Dec. 10.